Senior Dusty Page (Germantown, Wis./Kettle Moraine Lutheran) of the NIU men’s soccer team was named Tuesday to the Capital One Academic All-America Division I soccer team selected by the College Sports Information Directors of America (CoSIDA). Page is one of just 34 student-athletes to receive All-America honors. Page, a finance major with a 4.0 GPA, was the only player to start all 17 matches this past season for the Huskies, playing a team-best 1,518 minutes. The senior central defender tallied a goal on Senior Night against Bowling Green (Nov. 8) and also recorded an assist on the game-winning goal against Quinnipiac (Aug. 31). “This is another very well-deserved award for Dusty,” said NIU head coach Eric Luzzi. “This award puts Dusty in some pretty special company, as only about 30 student-athletes from the entire country received this accolade. 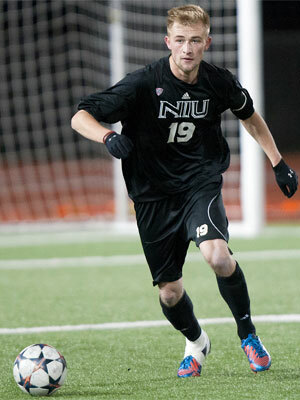 In his four-year NIU career, Page appeared in 49 career matches, making 43 starts. Page is a two-time CoSIDA Academic All-District honoree and also serves as the vice chair of the NCAA Division I Student-Athlete Advisory Committee (SAAC). Page is the fifth NIU men’s soccer player to earn CoSIDA Academic All-American honors, joining Sigurd Slaastad (1996, ’97), Jeff Stojak (1998, ’99), Andy Champion (2003) and Kyle Knotek (2008, ’10). To be eligible for Academic All-America consideration, a student-athlete must be a varsity starter or key reserve, maintain a cumulative GPA of 3.30 on a scale of 4.00, have reached sophomore athletic and academic standing at his current institution, and be nominated by his sports information director.